On June 2, the postman rang once -- and, boy, did he ring. "This is the Wall Street Journal. We're writing to ask if something is bothering you. The sun shined in April and you didn't spend much money. The Commerce Department here in Washington says your spending didn't increase at all, adjusted for inflation last month, compared to March. "You've been saving more too. You socked away 5.6% of your income in April after taxes, even more than in March. This saving is not like you. What's up? "Fed officials want to start raising the cost of your borrowing because they worry they've been giving you a free ride for too long with zero interest rates. We listen to Fed officials all of the time here at The Wall Street Journal, and they just can't figure you out." Well, on behalf of the "stingy American consumer," we'd like to answer this letter to best of our ability. "Your frustration is well founded. Something is off. People have taken the Fed's gift of free money and returned it to sender. 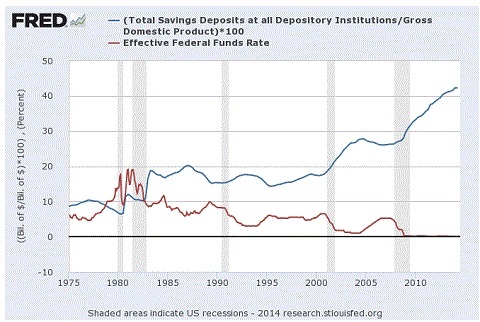 This isn't normal, as the chart of the total savings versus the Federal Funds rate since 1975 shows. "Here you can see that for the better part of four decades, lower rates coincided with mild to steady savings... until mid-2000. Then, the pattern changed drastically. The cheaper it became to borrow, people borrowed less -- a lot less. "'What's up?,' you ask? What changed to compel this radical shift toward thrift? When the social mood trend changes from optimism to pessimism, creditors, debtors, producers, and consumers change their primary orientation from expansion to conservation.... consumers save more and spend less. A defensive credit market can scuttle the [central bank's] efforts to get lenders and borrowers to agree to transact at all, much less at some desired target rate. During deflation, they cannot even induce them to do so with a zero interest rate. These behaviors reduce the 'velocity' of money, i.e. the speed with which it circulates to make purchases, thus putting downward pressure on prices. These forces reverse the former trend. Most economists are baffled: 'One of the greatest mysteries is why the U.S. has lacked inflation, despite all the money being pumped into the economy.' This long-term chart of the CPI shows a succession of lower highs since the early 1980s, as inflation turned into disinflation, which is on the cusp of leading to outright deflation. 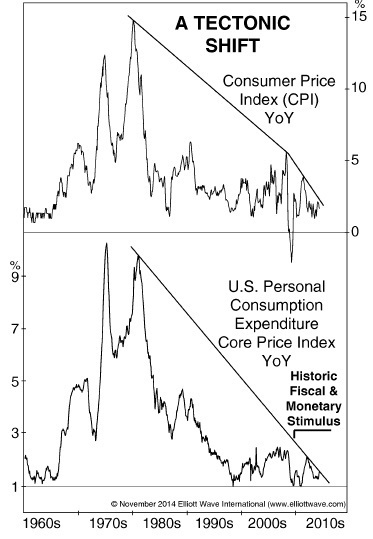 Some argue that the Consumer Price Index is rigged to show milder levels of inflation, but the bottom graph shows the same steady move toward the zero line in the Personal Consumption Expenditures Index, an alternate inflation measure favored by the U.S. Fed. "Deflation is rare. Because of that, few people understand it. Deflation is also tricky, because it makes even the most 'reliable' financial assets to lose value, and those assets that no one expects to grow to actually gain. "The 'stingy' consumer is not the cause; it's the effect of a deflationary trend now underway in the world's largest economy." 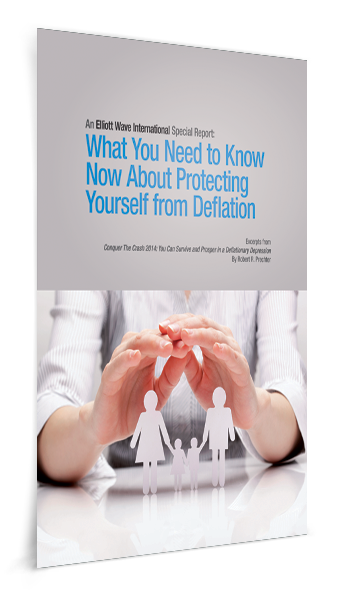 "What You Need to Know NOW About Protecting Yourself From Deflation"
Get this free 10-page report about the unexpected but serious risk to your portfolio -- with highlights from Robert Prechter's New York Times' business bestseller, Conquer the Crash. 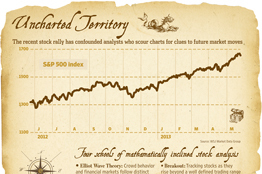 You'll get 29 specific forecasts for stocks, real estate, gold, cultural trends and more. This article was syndicated by Elliott Wave International and was originally published under the headline The Fed's Gift of Free Money: Return to Sender. EWI is the world's largest market forecasting firm. Its staff of full-time analysts led by Chartered Market Technician Robert Prechter provides 24-hour-a-day market analysis to institutional and private investors around the world. In 1816, Robert Stirling patented the "Heat Economiser, which could take concentrated heat from anywhere and turn it into dynamic energy through the use of two pistons. But steam, as the working gas, was an inefficient and dangerous power source when Stirling started. The Stirling patent was sold to NV Philips for development of a back-up generator and NV Philips re-licensed the patent to FFV, a Swedish state-owned manufacturer of torpedo's and other weapon systems. The FFV subsidiaries of Stirling Power Systems (Sweden) AB and Stirling Power Systems Corporation (SPS) in Ann Arbor, MI, USA continued to develop the engine technology for use as primarily co-generation power sources. As the SPS Vice President of Marketing and Administration, I was personally involved in the development and marketing of the V160-powered Stirling co-generation sets for mobile recreational vehicles (RVs), for military operational field usage, and as a residential gas-fired co- generation heat-pump package (sponsored by the Gas Research Institute, Chicago, IL). Other applications included biomass-fueled V160 power packs, as well as a solar tracking dish which concentrates the sun's rays to the Solar Power Pack. Working with a Wall Street Investment Banker, SPS was sold in 1986 to the McDonnell Douglas Corporation. See Crain's Detroit Business, March 24, 1986, for more information. The following article was written by Elliott Wave International's Senior Instructor Jeffrey Kennedy to show what you can expect from a market at the completion of various Elliott wave patterns. Jeffrey, a Chartered Market Technician and highly sought-after speaker and teacher, will host a free Trader Education Week, August 20-27. Learn more now. Some people think the Wave Principle is complicated. But, in reality, all you need to know to find trading opportunities are the five core patterns: impulse waves and diagonals move in the direction of the larger trend; the zigzag, triangle and flat are corrective waves that move against that trend. 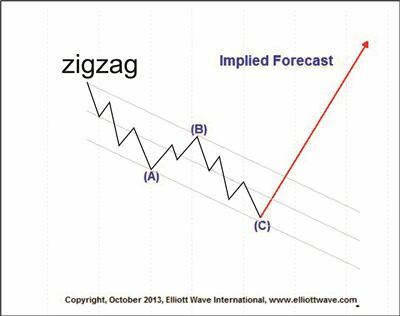 This chart shows a corrective pattern called a zigzag. It is a three-wave move that is typically contained in parallel lines, which I call the corrective price channel. Whenever you see an A-B-C decline such as this where, ideally, wave C equals the distance travelled in wave A, the implied forecast is a move to the upside back to beyond the origin of the pattern. For example, the May through September pullback in SolarCity Corporation (SCTY) consists of three waves (a zigzag), which forecasts a rally beyond the May high. The price chart of Pfizer Inc. provides another example of the forecasting ability of the Wave Principle. A triangle is a wedge-shaped corrective, or countertrend, wave pattern that is fully retraced upon completion. As it stands, this pattern is incomplete and requires additional subdivisions. Even so, this structure implies that the larger uptrend is still intact and that new highs beyond $31.15, the point at which the triangle began, will ultimately develop. 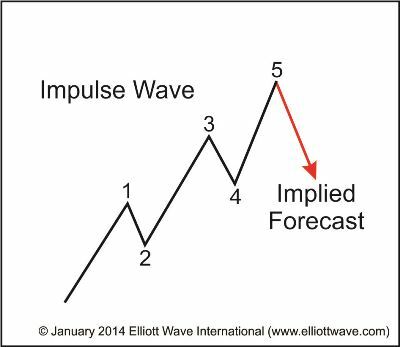 This article was syndicated by Elliott Wave International and was originally published under the headline 2 Examples of the Forecasting Ability of the Elliott Wave Principle. EWI is the world's largest market forecasting firm. Its staff of full-time analysts led by Chartered Market Technician Robert Prechter provides 24-hour-a-day market analysis to institutional and private investors around the world. The scope of U.S. stocks' record run has surprised almost everyone in the investing world, bull and bear alike. That includes technical analysts who track every twitch in the broad-market gauges, trying to transform historical price and volume data into a clear picture of future stock moves. The 6,000-point rally in the Dow Jones Industrial Average over the past four-plus years has made many believers among technical analysts. "When you're in brand-new territory, it's difficult to say what will be resistance," said Jay Lefkowicz, technical strategist at New York brokerage firm Concept Capital Markets, referring to where the rally will stall. "There are people involved, so it's not always an efficient market." Technical analysts employ different tools to try to unfurl that and other mysteries. Walter Zimmerman, chief technical analyst at New Jersey brokerage United-ICAP, leans on the Elliott Wave Theory, formulated by Ralph Nelson Elliott during the Great Depression. It is based on the belief that crowd behavior tends to follow quantifiable cycles and patterns. The theory leans heavily on the Fibonacci sequence, which is a mathematical pattern of progression based on the ratio of 1.618 that has been used to describe natural phenomenon, such as the breeding pattern of rabbits and human body proportions. Based on his interpretation of different Elliott Wave cycles and recurring technical patterns, Mr. Zimmerman sees multiple potential resistance levels for the S&P 500 between 1750 and 1790. That would mean gains of at least another 4% for stocks from Wednesday's midday levels. He adds a caveat. "We're not trying to outsmart the market by picking the top." The price objectives are only intended to be levels where "we should be watching the market extra closely," Mr. Zimmerman said. That said, all the forecasts are apt to be fallible for a familiar reason. "The reason some patterns tend to repeat themselves, is the one thing that all markets at all times always share: human nature," Mr. Zimmerman said. Elliott Wave International (EWI), the world’s largest market forecasting firm, has just released a free eBook to teach you exactly that. How to Spot Trading Opportunities features 47 pages of easy-to-understand trading techniques that help you identify high-confidence trade setups. Senior EWI Analyst Jeffrey Kennedy will show you how some of the simplest rules and guidelines have some of the most powerful applications for trading. Created from the $129 two-volume set of the same name, this valuable eBook is offered free until June 3. Don’t miss out on this rare opportunity to learn how to find opportunities in the markets you follow. 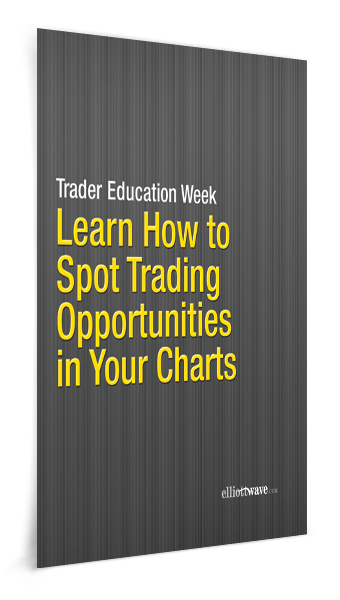 Download How to Spot Trading Opportunities now. When the debt pyramid implodes, the only valuable asset is cash. GOLD suffered its biggest two-day fall in 30 years on April 12th and 15th. When an asset falls so sharply in price, it is tempting to believe that significant economic changes must be afoot. Like the government-backed paper money that gold bugs despise, gold is precious only so long as enough people agree that it is. Exactly; when too many people agree that gold is precious, it’s a top. When too few agree, it’s a bottom. Successful market analysis is rooted in irony and paradox. Our gold and silver analysis at the peak two years ago relied heavily on five arguments directly opposed to those offered everywhere else we look. On Tuesday afternoon (April 23), Robert Prechter, a famed market technician known for calling the roaring bull market of the '80s, the 1987 crash and the March 2009 stock market low, published an urgent new issue of his Elliott Wave Theorist. This issue is so powerful -- and so urgent -- that EWI has unlocked the first two pages for you to read with no obligation to buy. Every issue of the Theorist provides you with a unique look at tomorrow's news today. This issue meets that high standard and more. It's one of the most powerful and revealing issues of the Theorist subscribers will ever read. Now, Prechter is not always right. Unfortunately, no market analyst is. But there's one thing his readers know for certain: When Prechter revs up his urgency, he sees something big on the horizon. Due to the timely nature of this issue, EWI cannot make the first two pages available indefinitely, so they've set a date of May 8 to end this special promotion -- at which time the first two pages will no longer be available for free. When in doubt, it is rare that your stockbroker will tell you to get out. We don't always agree with Bob, but we do respect his outlook. This special two-page Theorist is worth your time. Follow this link to read it now. How Do Market Losers Think?